Pettersson bat detectors are renowned for their high quality and reliability. Since the start in the early 80's, many thousands of bat detectors have been sold all over the world. Our customers are e.g. universities, ecological consultants, environment departments and naturalists. Heterodyning and frequency division are real-time methods (i.e. the sound from the detector is heard at the same time the call is emitted by the bat). Heterodyning is the most sensitive method of the two but only transforms a small portion of the ultrasonic frequency range. The user selects the range to transform with a tuning control similar to tuning in to a radio. The frequency division method transforms the entire ultrasonic frequency range without tuning. In a frequency division detector, the frequency of the ultrasound is divided by a constant factor, e.g. 10, meaning that a frequency of 50 kHz will be converted into 5 kHz. All of Pettersson Elektronik's frequency division detectors are of the more advanced retained amplitude type. This means that the amplitude of the transformed signal follows that of the original ultrasonic signal. An example of this is shown to the right. 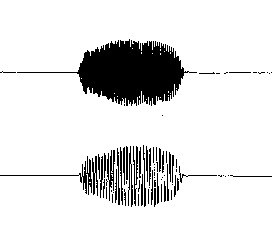 The upper signal is the original ultrasound, while the lower is the frequency division output signal. The time expansion method is similar to making a high speed tape recording of the sound and then playing it back at a lower speed, however time expansion detectors use digital techniques to store the signal instead of a large and expensive high speed tape recorder. Obviously this is not a real-time conversion method, but in return it offers a number of important advantages. Since the signal is stretched out in time, it is possible to hear details of the sound not audible with other methods (e.g. you can actually hear frequency differences within one short pulse or between different pulses). Time expansion also preserves all characteristics of the original signal, making time expanded signals ideal for sound analysis. As an alternative to time expansion, there are also direct recording devices that record the original ultrasound without transformation. Some of these are specifically made for long-term, unattended recording of bat calls. Obviously, such recorders preserve all characteristics of the signal, just like time expansion detectors.